This is perhaps the most famous of Shakespeare’s sonnets, made so because it is often taken as a loving monument to the beauty of the speaker’s beloved. After all, the beloved here is compared to one of the loveliest of things—a summer’s day—and comes out the winner for she is deemed “more lovely and more temperate” than that harsh, changing, and ever-declining season. Indeed, the poet says, the beloved’s brightness is “eternal” and “shall not fade.” What more powerful expression of love could there be than this, the steadfast belief in a lover’s eternal beauty and grace. In this case, the catch is that the beloved’s eternal beauty will not fade so as long as “this”—“this” being the poem itself—lives and “gives life to thee.” It is the poem that makes the beloved’s beauty immortal, not her beauty itself that is immortal. And where does this poem come from? Why from the poet, of course. As is too case often in love, it turns out to be all about the lover rather than the beloved. Painting by Jean-Honore Fragonard (1732-1806). Post by Karen Swallow Prior, author of Booked: Literature in the Soul of Me. I love this! I admit with shame that I’ve always had a hard time with Shakespeare, though I do love his (or her) poetry. What really interests me in this sonnet, and what you say of it here, comes from the fact that I was watching “The Bachelor” tonight. I actually despise that show and how shallow it is, so I don’t know what drew me in tonight. I think the more ridiculous and un-founded professions of affection they made to each other the more I had to watch. It’s like a train wreck waiting to happen. So, that being said – I like the distinction you make between a lover and a beloved. A beloved is someone who is cherished, known, loved – and above all – has a commitment to the other beloved. When I was watching the bachelor, I saw how fast minds changed. A particularly steamy beach scene caused me, naturally, to reflect on my relationship with my husband and I currently feel. It would be nice to have an all expenses paid romantic beach getaway with him, but the reality is – he is working tonight and I am doing the dishes. And he will probably barely mumble a hello to me in the morning before he crashes to sleep all day. Luckily, I can see through the marketed romanticism of the bachelor (thanks to good teachers and good literature), and other sappy reality tv, and I don’t let it steal the joy I have in this life with my beloved. Dishes or steamy beach scene – I can be content in either knowing I have a man who would work 7 pm to 7 am to provide for our family. That speaks more than any sonnet. Those are just some of the thoughts that went through my head as I read this. I do have some questions, though. I wonder what all the poet meant by saying her beauty was eternal so long as the poem gave life to it. Was it that he was under-handedly saying “you will get ugly someday, but this poem will bring me back to a time when I thought you were smoking hot” or what was Shakespeare trying to do? Maybe that is a stupid question, but I feel like if he is doing what I think he is doing, that is a snarky sonnet! If Shakespeare were here now, (he or she 😉 ) would most certainly be the Royal One of Snark. Would love to hear what the source of the hard time with Shakespeare is… maybe the old language? Well, I need to come back and talk about the poem tomorrow, but your comment tickled me through and through, so I got lost in this instead. I think I have a hard time with his poetry because I want to read fast. I rush when I read (it is not something I’m proud of), and it often causes me to miss important details. When it comes to poetry, rushing can be severely detrimental to my final understanding of the poem. I’ve become a much better reader over the few years, but I find myself having to slow down even MORE than normal with old poetry. It may be because of the language. So poetry is slowing. And maybe good poetry is even more slowing. 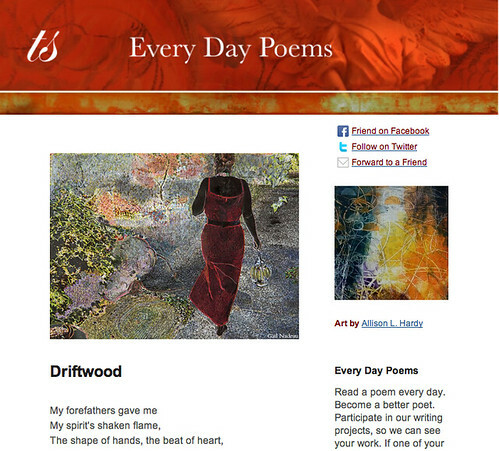 I know that people who get our Every Day Poems often use it almost like a meditative morning moment. Perhaps because of just this? To really enjoy, they must slow? Very cool that you could pinpoint that, Lauren. I just had to take time out of my class today to do some remedial work with my students on reading poetry. I wish I’d had this quote from L L. “Poetry is slowing. And maybe good poetry is more slowing.” I will be using that. And quoting it. For a long time. I never thought of the idea you suggest: that the life given to the beloved might serve the lover when her beauty has passed. That is a nicely deconstructive reading of the poem that has great merit, I think! And, of course, the traditional reading–that the poem has accomplished this as evidenced in our still reading it today–works, too. Yes, poems are to be read slowly, savored, sipped not slugged. Our culture today does not really know how (or want) to do that …. Oh, I hear you! Words are so powerful and I have the same love/fear relationship with journals and other personal written records … such power. Users (writers and readers) beware! When we studied this poem in college, a student asked how Shakespeare could have used a word like “temperate” to describe summer. Of course, we were Central Texas, where it’s usually over 100 degrees for 30-60 days, unlike England. True story! That is hilarious. That is one of many reasons that I love teaching! I have to say, I am with Donna on this one. I use this sonnet in my writing courses to introduce the idea of the permanence of writing to the class for their input and discussion. I interpret the poem as Shakespeare wishing to immortalize her beauty in writing so others may know, for centuries past their own lives, how beautiful she was to him. And the poem has done just what he promised. We go on to discuss in class why writing is so binding (used for legal documents, etc.) I have never pictured this sonnet as snarky, rude, or self-centered, but I can now see how it may be interpreted that way. I think I still prefer the other way, but multiple interpretations is part of what makes Shakespeare’s writing great! Shelah, that is such an interesting reason to use the sonnet. I wonder… is some writing more permanent than others? And, if so, what makes it so? I don’t think our views differ! I’m saying that this poem is really about ART (writing) not LOVE as so many tend to take it.